It has been brought to our attention that someone “shared” a post from United Liberty’s Facebook account. This person used very hateful, very threatening comments on their own separate account. Obviously, United Liberty does not condone such comments or behavior. As libertarians we do not believe that violence or racism has any part in a constructive political debate. Although we disagree with President Barack Obama on many aspects of public policy, that has nothing to do with race. The United Liberty team has staff dedicated to meticulously combing through all non-staff posts on our Facebook and our website and removing all posts or comments that contain this sort of offensive message, a practice that we began at our inception. While we cannot control what groups or individuals do or say outside of our own Facebook page and website, we do regret that our content was used in such a hateful manner. Below is a Letter to the Editor, sent anonymously to United Liberty by a reader. 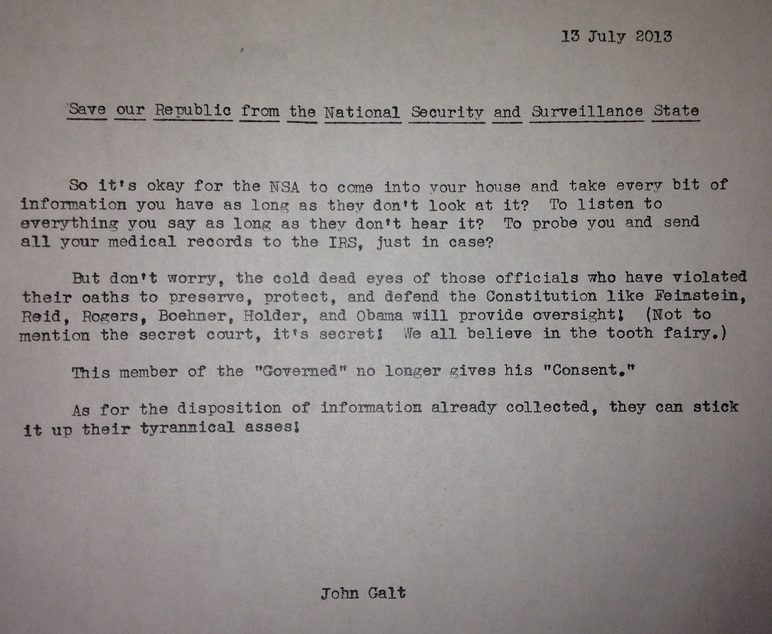 The full, typewritten letter can be found below (click to enlarge). So it’s okay for the NSA to come into your house and take very bit of information you have as long as they don’t look at it? To listen to everything you say as long as they don’t heard? To probe you and send all your medical records to the IRS, just in case? As for the disposition of information already collected, they can stick it up their tyrannical asses! In light of recent statements made and actions taken by Adam Kokesh, United Liberty wishes to reaffirm its commitment to individual liberty, limited government, free markets, and peace. We believe there is a bright line between the type of civil disobedience of the 1960s that helped secure the rights of the disenfranchised, and the notion of potentially violent conflict with federal law enforcement. We endeavor to continue the temperate, reasonable, and incremental work of spreading libertarian ideas through this site and other media. Adam Kokesh is clearly a troubled individual, and his fringe views should in no way ever be construed to be consistent with the ideals we hold dear. Being a libertarian-leaning blog, we touch on a variety of issues. From those of you that aren’t familiar with libertarianism, it is a philosophy grounded in individual liberty, limited government, and free markets. Our commentary is based from that unwaivering viewpoint. This past provided endless fodder for bloggers. From the push for the Stop Online Piracy Act (SOPA) to the terrorist attack in Benghazi to the 2012 election. While there was plenty to talk about this year, 2012 also served as a reminder that our liberties are still being slowly taken away. Welcome to United Liberty’s Super Tuesday Live Blog. We’ll be getting started around 6:30pm or so. But before you join in on the conversation, here are some links to read on things to look for this evening. Over at FiveThirtyEight, Nate Silver lays out the various scenarios that could unfold tonight, including delegate projections for all four candidates. Politico has a list of 10 things to watch for tonight, including Ohio, where a win could help Romney put the race to bed much quicker. CNN only gives three things for us to watch, but one of them (voter turnout) could obviously be a game-changer. In keeping with the goal to educate readers about the dangers of SOPA and PIPA, here is a piece by Jason Pye, originally posted by on December 27, 2011. We’ve been posting a lot about the Stop Online Piracy Act (SOPA) lately. You’re going to continue to hear about it online over the next few weeks. SOPA is touted by supporters as legislation that would prevent copyright infringement and secure intellectual property rights, but it would actually promote internet censorship and ignore due process. In fact, SOPA isn’t likely to stop piracy. Hah. Yea, it was a funny one. 10 years 12 weeks ago on Ron Paul on House Floor: "Iran is responding to our hostile rhetoric."